A hotel manager has been sacked after posting scathing responses to guests who wrote bad reviews about The Georgian House Hotel in Glasgow on Tripadvisor. 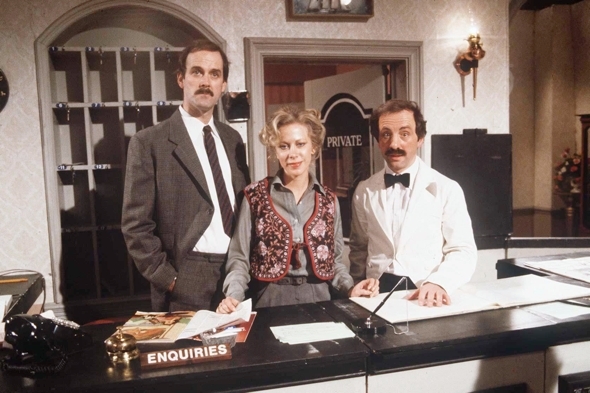 Virginia Giovanni wrote a number of responses to reviews on the site that have incurred comparisons with Basil Fawlty, the fictional hotel manager who ranted at difficult guests on the hit show Fawlty Towers. The budget hotel starts at £20 for a night and is situated in Glasgow's West End. Its website reads: "The rooms are clean, bright and comfortable and offer great value for money. If you are looking for a cheap hotel in the very best location in Glasgow you have found it!" But many guests disagreed and took to Tripadvisor to say so. According to the Daily Record, following his stay, one guest wrote: "Arrived at 18:00 to find nobody home and stood on the doorstep for an hour waiting for the manager to return. "Then given a twin room instead of the double booked. The room in the ­basement did not have any windows, they were blocked by shutters which I could not open." Posing as the hotel's owner, Giovanni replied: "What do you expect? You pay little, you get cheap. We are a budget hotel. Get real." Another guests gave the hotel a one-star rating and wrote: "Would I use this place again? Only if the horses from hell dragged me there." Giovanni responded: "Thanks for your money, sucker. Long may the idiot line continue." The hotel's owner, Elizabeth Morris, confirmed to the Mirror that Giovanni had been sacked over the incident. A hotel spokesman told the paper: "Basically, it was an errant member of staff. The woman put the comments on, making out that she was the owner. "Elizabeth is writing to guests who stayed over that period to apologise." With bagpipes, Highland dancing and unrivalled views over Loch Faskally, you would struggle to find a more Scottish hotel retreat than The Green Park Hotel in Pitlochry. This family-run hotel in Perthshire organises activity weekends from painting to scrabble holidays and Hogmanay breaks. Rooms from £108 for a double per night. Potters Leisure Resort is apparently the UK's first five-star holiday village, and gets the thumbs-up all round from Tripadvisor reviewers. Think entertainment evenings and theatre shows galore - including concert with Peter Andre and performances from Strictly Come Dancing pros Natalie Lowe and Ian Waite. Two-night entertainment breaks start from £209 for two. Swinton Park, the former ancestral seat of the Earl of Swinton, provides castle accommodation set in 20,000 acres of the rolling Yorkshire Dales. The emphasis here is on fresh, local food and the grounds house a four-acre kitchen garden, restaurants and a cookery school where you can be taught the culinary arts by TV Chef Rosemary Shrager. Prices from £260 for a two-night stay with bed and breakfast. "The service is outstanding from the moment you arrive, genuine staff who cannot do enough for you. The suites are beautiful, and location perfect! " At 51 Buckingham Gate, Taj Suites and Residences, you've almost got the Queen on your doorstep. With butler service, the michelin starred Quilon Restaurant and an exclusive spa, 51 bills itself as the luxurious home away from home. Car enthusiasts should book the Jaguar Room, which features damask wallpaper, wood panelling and a fireplace in the shape of a Jag's rear window. From £625 per night. "I cannot fault this hotel - the location just off Trafalgar Square was perfect, the staff attentive, the ambience elegant," raves one Tripadvisor reviewer.With opulent rooms and imposing central location next to Trafalgar square, The Corinthia London boasts panoramic views of London you'll find the city's largest spa and wellness facility. Rooms start from £350 per night. "Yes yes yes!! service, great food and hypnos king size mattresses - I am in heaven, very rare that you get all the ticks in the box." The cubist, modern facade of Casa in Chesterfield doesn't look like it hides one of your typical, top rated hotels. There isn't a claw-footed bathtub or oil painting in sight, instead you'll find rain showers, LCD TVs and the Cocina restaurant where the chefs use Spanish charcoal-fired ovens to create Mediterranean dishes. Rooms from £99 per night. The beautifully restored period Ellenborough Park sits next to the Cheltenham Racecourse estate and is equipped with a heated outdoor swimming pool and an Indian themed spa. Guests can indulge in some country pursuits and try their hand at private game or clay pigeon shooting, polo and racing. Rates from £300 per night in a classic room. The Grade II listed, boutique Milestone Hotel apparently can't be beaten for luxurious London living. With 45 bedrooms, 12 suites and six two-bed apartments, rooms over overlook Kensington Gardens and come with a 24-hour butler service, with no task too small. They'll even unpack your bags, provide children's entertainment and make sure your pet is settled into the hotel. Prices start from £450 per night for a superior double room. First prize goes to Rudding Park, with its impressive, landscaped surrounds and impeccable service. Tripadvisor reviewers raved about this privately owned AA 4 Red Star Harrogate hotel, with has a spa, gym, private cinema and an 18 hole golf course. A stay in one of the hotel's Follifoot Wing double rooms starts from £278.33 per night. Located in the heart of Stratford's vast Westfield shopping centre, the Staybridge Suites make an ideal slick, city crash pad, say reviewers. Take a seat in the bar and look out over the Olympic Park, with its twisted Anish Kapoor installation and Olympic Stadium. From £119 for a king bed studio with breakfast.